Definition: Integrated use of data, policy and practice to plan for necessary staff, recruit, hire, deploy, develop and support health workers. Performance management: performance appraisal, supervision and productivity. Performance management system in place. Analysis of Labour Turnover Tool. Everybody’s Business: Strengthening Health Systems to Improve Health Outcomes: WHO’s Framework for Action. World Health Organization, 2007. Human Resource Management (HRM) Assessment Instrument for NGOs and Public Sector Health Organizations. Management Sciences for Health, 2006. 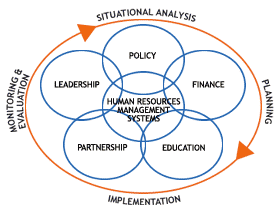 Human Resource Management (HRM) Assessment Tool for HIV/AIDS Environments. Management Sciences for Health (MSH), 2006. Human Resources for Health: A Gender Analysis. Asha George, 2007. Monitoring the Building Blocks of Health Systems: A Handbook of Indicators and Their Measurement Strategies. World Health Organization, 2010. Monitoring the Health Workforce: Measurement Issues and Tools. World Health Organization, 2008. Recruitment and Hiring. Management Sciences for Health (MSH), n.d. Task Shifting: Rational Redistribution of Tasks Among Health Workforce Teams, Global Recommendations and Guidelines. World Health Organization, 2008. Building the Bridge from Human Resources Data to Effective Decisions: Ten Pillars of Successful Data-Driven Decision-Making. The Capacity Project, 2008. Data Quality Considerations in Human Resources Information Systems (HRIS) Strengthening. The Capacity Project, 2008. Human Resources Management (HRM) in the Health Sector. The Capacity Project, 2006. Incorporating Lay Human Resources to Increase Accessibility to Antiretroviral Therapy: A Home-Based Approach in Uganda. The Capacity Project, 2006. Strategy for the Rapid Start-up of the HIV/AIDS Program in Namibia: Outsourcing the Recruitment and Management of Human Resources for Health. The Capacity Project, 2006. Validating a Work Group Climate Assessment Tool for Improving the Performance of Public Health Organizations. Human Resources for Health, 2005. Workforce Planning for the Health Sector. The Capacity Project, 2006.